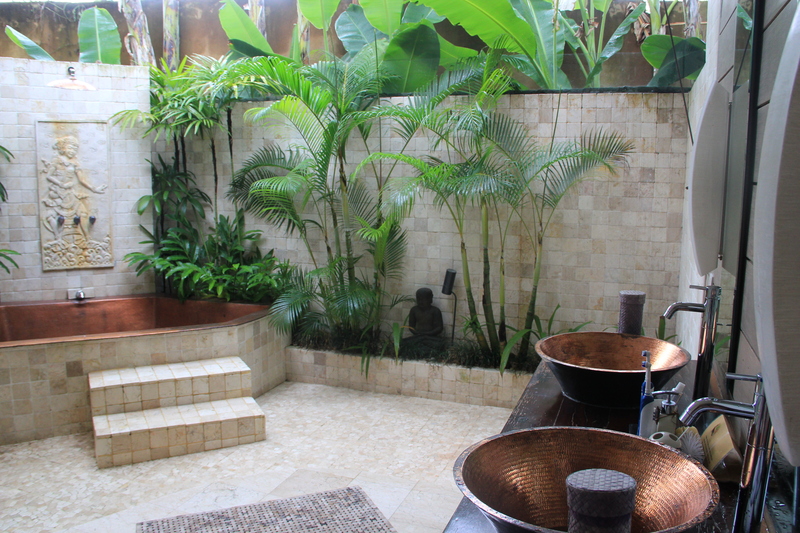 This is a trip report of our recent Bali vacation. To read Part I or (Day 1,2 and 3) of the trip report, click here. After 3 fabulous days in Bali, on day 4, we decided to take things slow. 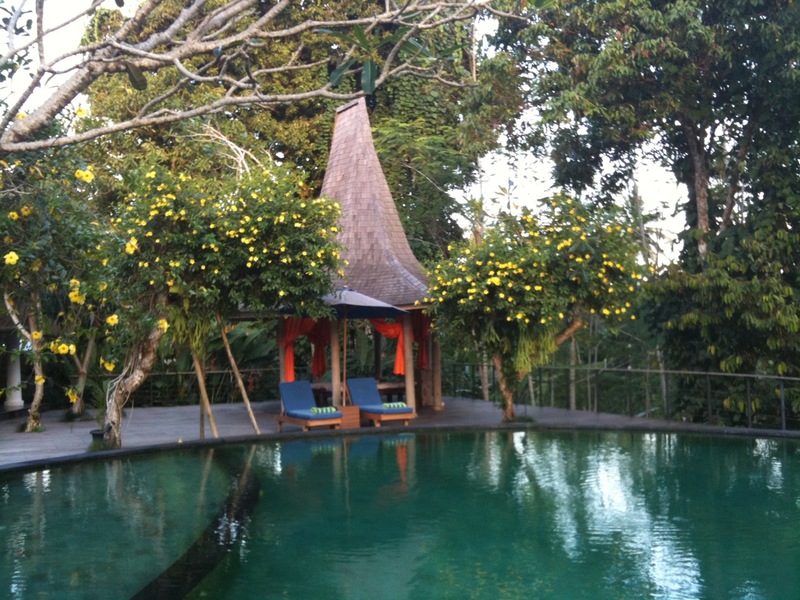 We started the day with a couple’s massage in a private cabana overlooking the pool and the forest. 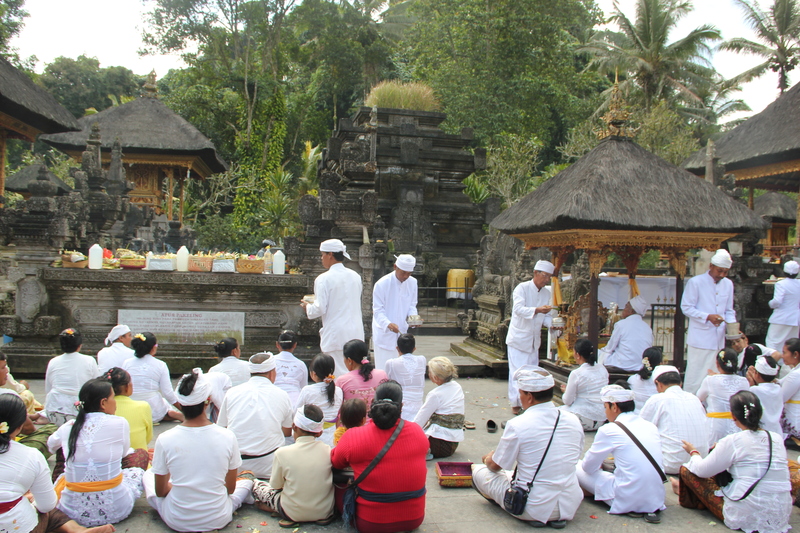 Bali is famous for its spa treatments and all tour books are filled with suggestions of various itineraries that combine tourism and spa journeys. 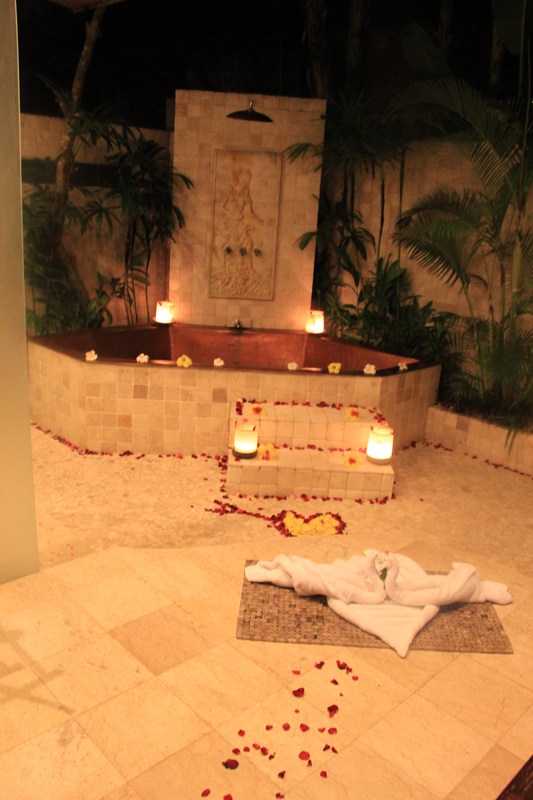 A 2 hour luxurious massage and facial later, arranged by the resort, we were thoroughly relaxed. The staff baby sat Varun while we enjoyed the massage. 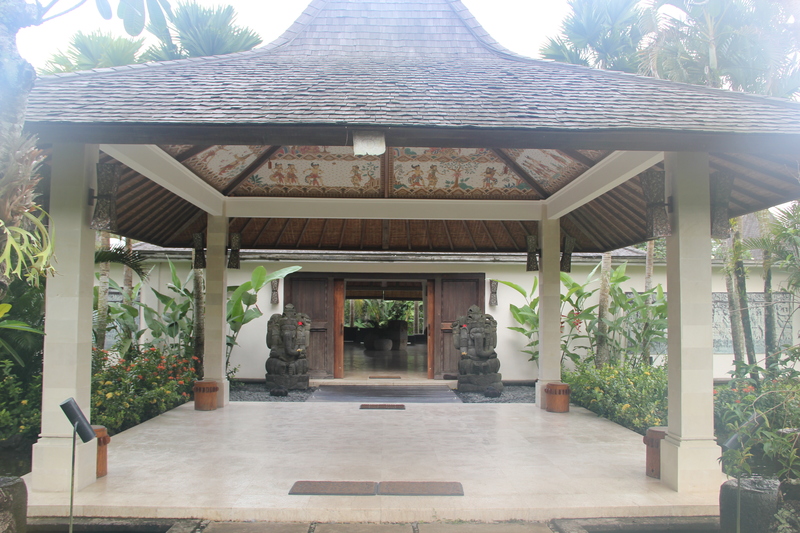 Many a Bali resorts have option of providing baby sitting services by the hour or day. For $25/day, you can hire your private nanny – usually a young girl, who will take care of the baby per your directions. 24-hour notice is usually required but as the staff was free, they volunteered to take care of Varun :). Through out the massage, I could hear Varun’s squeals of laughter as he was enjoying all the attention he was getting. After the massage, we decided to go into Ubud town for lunch. Before leaving, I had read about an organic Warung style restaurant overlooking the rice fields, Sari Organic, which we were very keen on trying. We asked the resort staff to drop us at the restaurant. When we reached there, we found out that the car cannot go up to the restaurant and instead its a 800 mt walk from the drop off location to the restaurant. Luckily, we had Varun’s stroller with us and we strapped him in and started off. 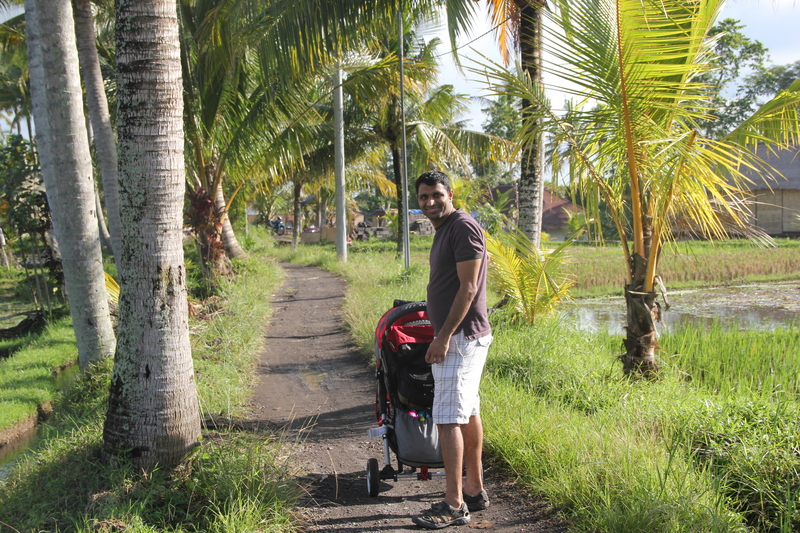 The walk started on a paved road, but soon turned into a little road winding through paddy fields and coconut trees along side a bubbling stream. Clumps of arum leaves were bobbing in the light mid day breeze while ducks wadded along sight navigating us to the restaurant. The quiet walk in the cool breeze helped Varun doze off. 20 mins later, we reached Sari Organic and sat in a corner seat overlooking the rice fields. With Varun napping, we made most of the lunch – cocktails, appetizers and a lovely modern Balinese meal of chicken sate, fried rice, stir fried beans and fresh salad from their own gardens. The place was crowded despite the late hour and we had a long leisurely lunch as everything is prepped from scratch. Varun woke up by the time, we were ready for dessert and enjoyed the dessert as much as the restaurants dog, who he chased around. The walk back was a bit of a challenge after this lovely meal, but we somehow managed it with Varun staying put in the stroller all along. Next stop, was Ubud market to buy some coffee, black rice and a few souvenirs. 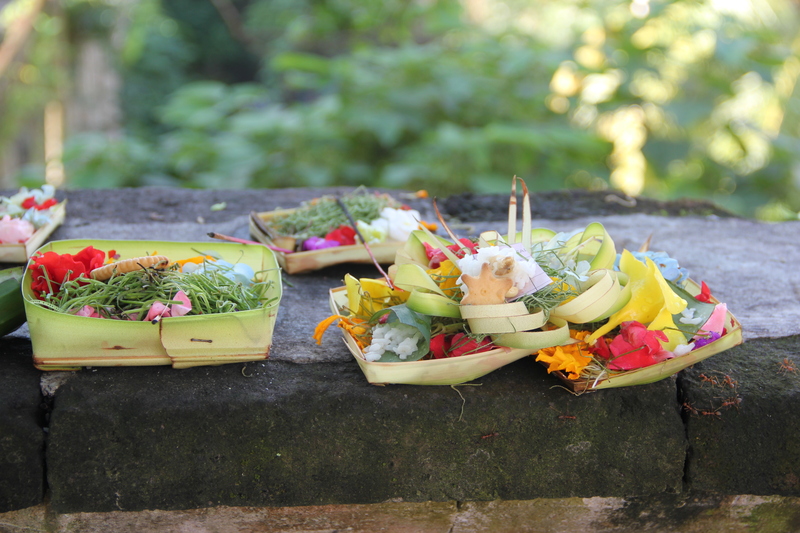 On the way,we saw the beautifully decorated Ubud Museum, people bathing in Ubud river, the Lotus pond place and another quintessential Balinese sight – daily offerings. En-route we stopped to have ice-cream. After all, what good are vacations, if we don’t indulge. Varun loves ice cream and it was awesome to just plop ourselves down in a street side with Varun and feed each other scoops of ice-cream. Some think of letting toddlers eat by themselves as messy, I think of it is as memories. Memories of those stained hands, clothes and face in afternoon sun as he shoves ice cream in his mouth and then in Vipul’s mouth , saying ‘Dadda turn’ will never fade. We contemplated going to the Monkey forest, but having heard stories of their aggressiveness, we didn’t want to risk Varun getting bitten by one. Also, it started to rain, so we ducked inside another store to buy some wood carved frames and then headed to a Starbucks for coffee. Fortified with coffee and cheese Quiche, Vipul and I tried the fish spa pedicure. Little tanks of fishes which nibble on dead skin on your feet promising glowing feet at the end of it. 25 mins of fish pedicure cost us about $15 . As usual, the staff entertained Varun while we sat with our feet stuck in the fish tanks. Passer by’s and fellow tourists made quick conversation with us asking us about the pedicure and whether it was painful. Some were amused, other intrigued enough to try it out themselves. This was more of a been there, done that, similar to our Submarine tour in Barbados, and is something we wont try again. Anyways, after the fish spa we caught a taxi back home. 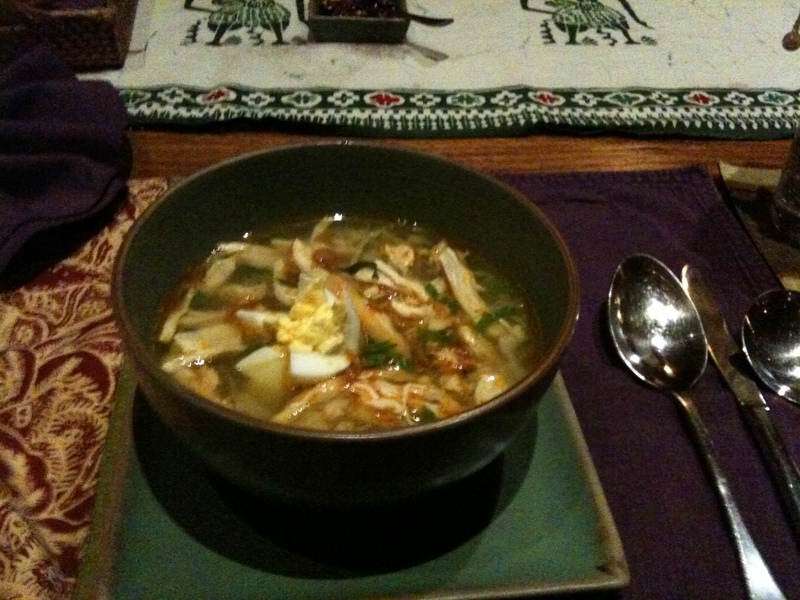 We had dinner at the resort – Soto Ayam, Fried chicken and Tomato Sambal followed by banana sundae. I requested the chef to let me watch him cook, which he obliged and it was awesome to pick up a couple of new techniques and recipes. The other staff played with Varun, while Vipul relaxed in the room. Dinner was served in the main dinning room – which had a fabulous Ikat table runner. the meal was simple and nourishing and I was glad to own the recipe and try that at home once we move into our apartment. Post dinner, Varun and Vipul read books while I went to bed. There were few options that we were contemplating for day 5. Start early and go on a all day snorkel trip to a nearby island, drive north to Ulun Danu- a Shiva temple of shores of Lake Beratan and visit Bali’s main fruit and vegetables market, drive west to the Cliff temple of Uluwatu or visit Semiyank. 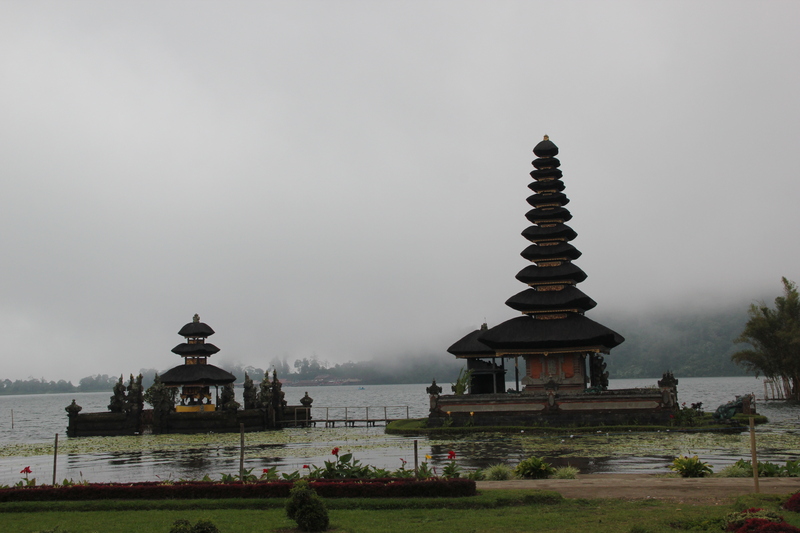 We decided to start the day with Ulun Danu and then continue to Uluwantu and finish the day with dinner at Semiyank. 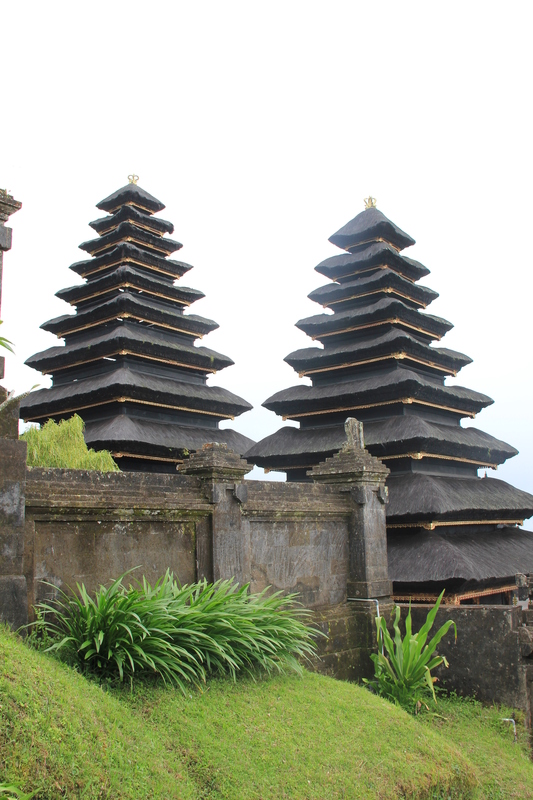 The drive from Ubud to Ulun Danu, goes through some small villages, before hitting the Bali country side. It passes through the prime agricultural areas and we could see farms of fruits and vegetables all along the road. This is also the agro- tourism highway and many a farms are open for tours and buying fresh fruits, coffee and spices. The air grew cooler as we drove north and we saw many strawberry farms along the way. We reached the temple complex just before lunch time. The mountains and the lake Beratan has low clouds and the black rock temple looked magnificent against the misty backdrop. 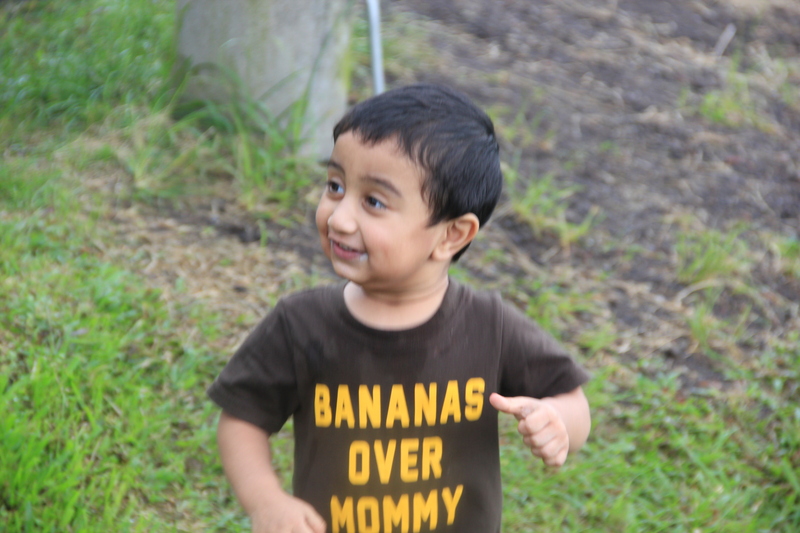 Varun had a ball running around the temple grounds and chasing the driver’s son. He was looking for fish in the lake water as he had grown accustomed to seeing koi fish in all ponds that we had seen so far, but didnt find any. Soon after, we stopped at a local buffet place for lunch. While the place itself was nothing to write home about, its location on banks of Lake Beratan was perfect. 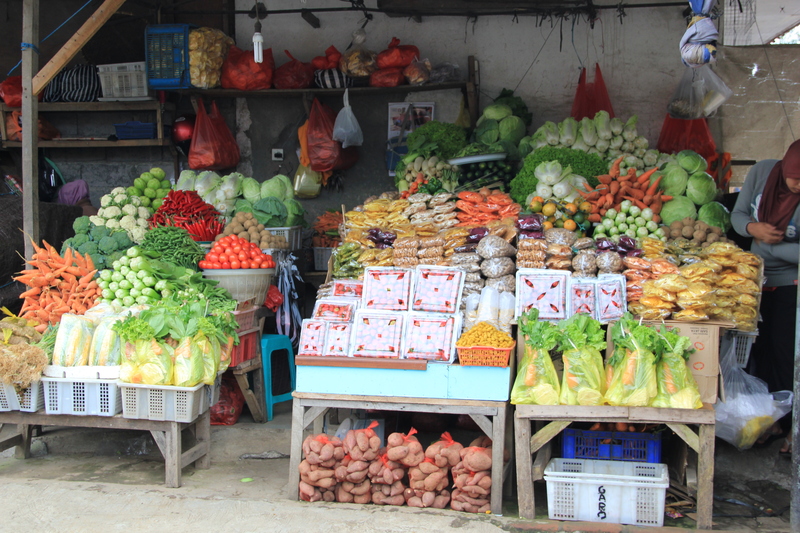 After lunch, we drove to Bali’s wholesale fruits and vegetables market. It was similar to a ‘saabji mandi’ in India or Pike Place Market in Seattle. After stocking on fruits like rambutan and strawberries which Varun took a fancy to, we drove to Uluwantu. The drive was through farms and terraced plantations. 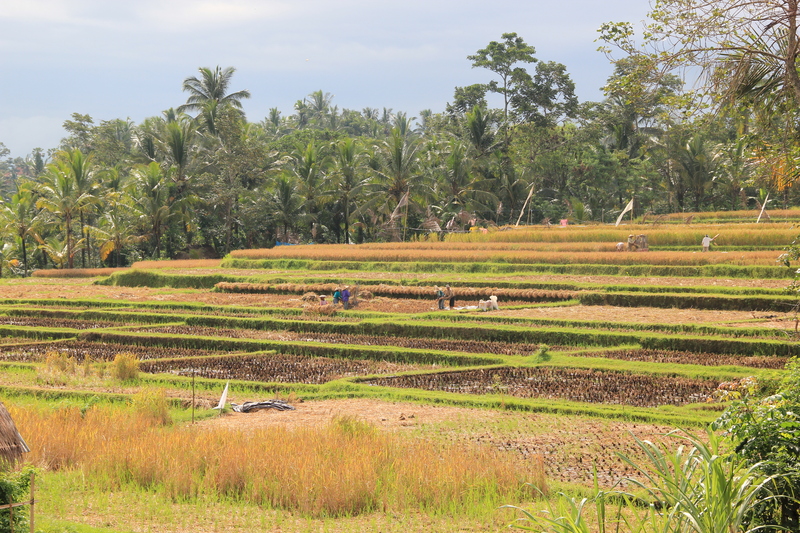 We stopped en-route at Jatiluwih terraced rice fields. This is a very famous ‘patel point’ in West Bali and most photographed rice fields in Bali. There are restaurants around here to linger over lunch or coffee and savor the views. We didn’t wait here but instead drove further west to Uluwatu. 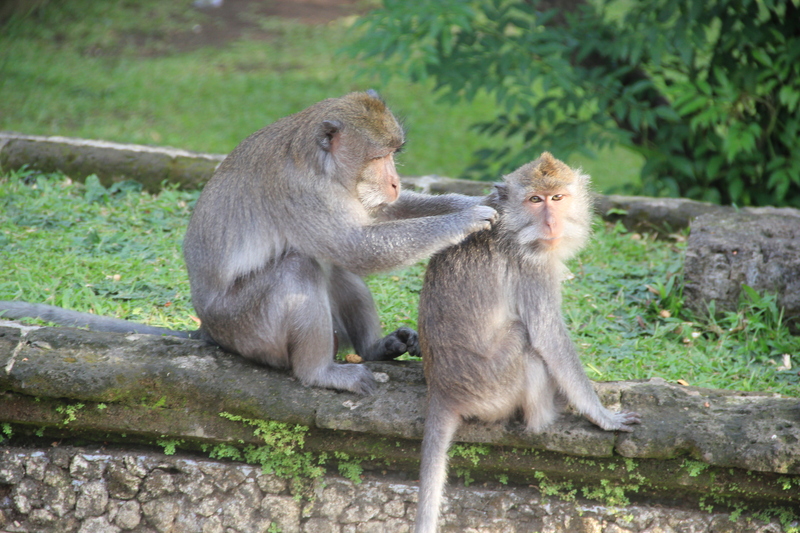 On the way, we stopped at a ‘friendly’ monkey forest. Varun loved seeing the monkeys but didnt get down from my arms or try and touch them as I expected. We reached the Uluwatu temple way before sunset and the temple complex was full of people waiting to find a spot to view the sunset. 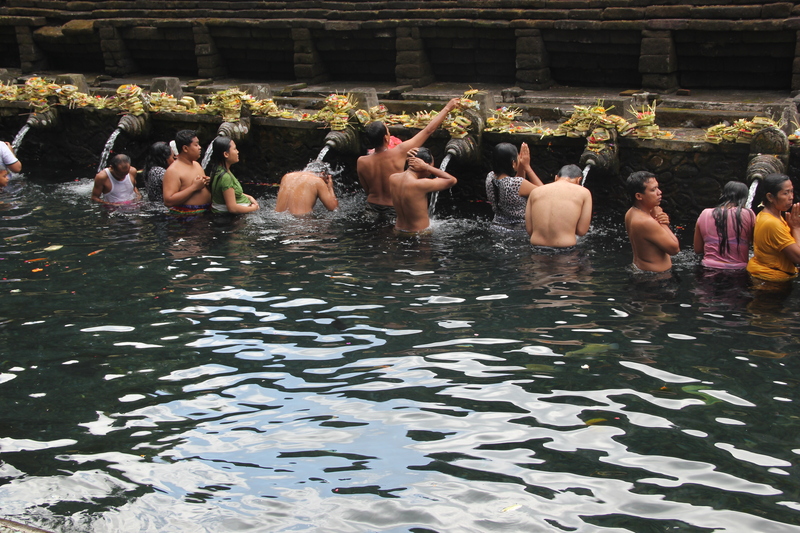 There was a separate line for people waiting to wade across to the rock that housed the temple. After dinner, we drove back to the resort. 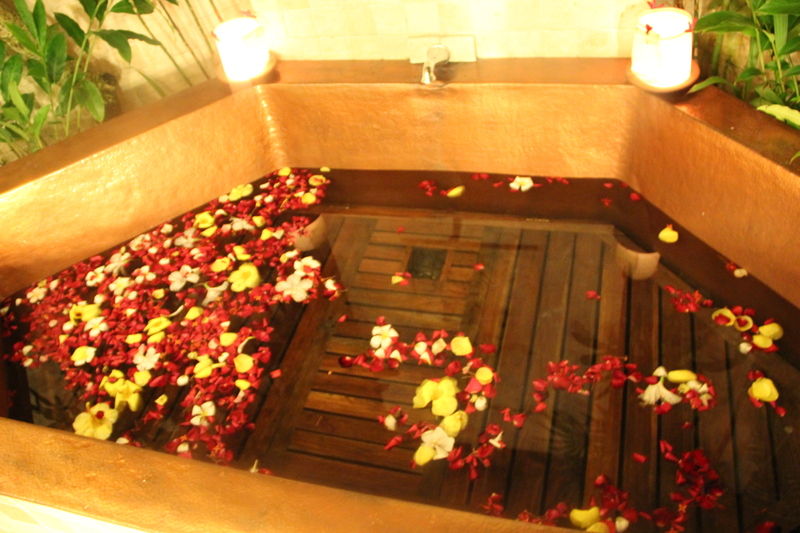 Now, Bali is famous for aromatic flower baths. They usually are complimentary with spa journeys but have to be requested. We didn’t know that and didn’t get one after our massage. But not wanting to miss out on luxurious once in – a-lifetime experience, I had asked the resort to arrange one for us for our last night stay in Bali. Needless to add, we made the most of it while the staff entertained Varun. Day 6 started late as we slept really late the previous night. and we had packing to do. After breakfast, Vipul played with Varun while I packed. That morning flew by and next thing I remember is loading our bags in the taxi. An hour or so later, we were at the airport. 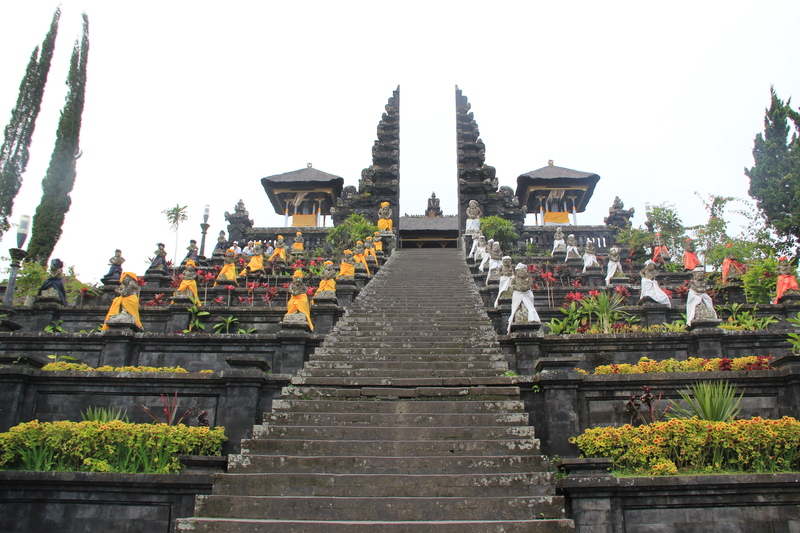 Bali is one of those countries that have the annoying practise of departure tax. Vipul struggled to find an ATM to withdraw cash to pay it. Post immigration and security, we found ourselves sitting at a cafe for lunch. As Varun played with the stroller, we realised this was first vacation which Varun enjoyed and didn’t need a doctors visit. We were very careful with water, food, restaurants we selected, avoiding crowded places and using a mosquito repellant. As we adjust to India, hopefully we will be able to handle other SE Asian countries better. A couple of weeks ago, Vipul’s team announced that they were going to get two days off for hitting an internal milestone. As soon as Vipul announced that we decided to take a couple of days off and go somewhere. It’s been a hectic year so far to say the least – from deciding to move, interviewing, actual logistics of the move, selling both our cars and the house, to landing here and starting all over almost immediately. We needed a break. As soon as our managers confirmed that we could take 4 days off in total, Vipul and I began wondering where to go. Northern India, Bhutan,Sikkim, Malaysia and Bali were our shortlisted candidates – limiting to places that won’t be impacted by early onset of monsoon or have very high temperatures. Northern India, Bhutan and Sikkim were eliminated due to really expensive last-minute flights as well as long drives to visit the destination. Malaysia requires a visa and Bali had via on arrival. So Bali it was even though our heart was really set on Bhutan. Hyderbad, similar to Seattle, does not have direct flights to anywhere fun. So we flew Malaysian Airlines to Kaula Lumpur and connected to Bali. Most Indians visiting Bali, stopover en-route in KL for a couple of days. 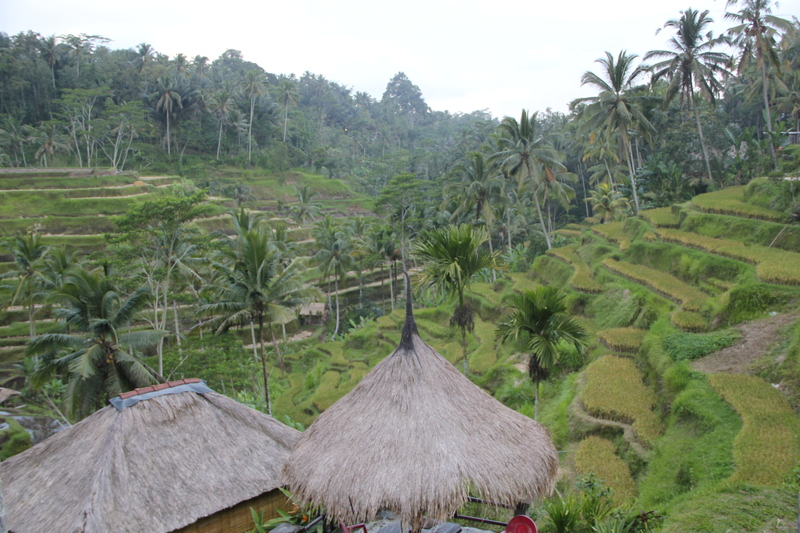 We wanted it to be a relaxing vacation so we flew to Bali and stayed in Ubud, central mountainous area of Bali, for 6 days. This was an impromptu trip so other than making flight reservations and deciding a place to stay (on Expedia), we didn’t plan on anything. We had a rough idea of things to do and places to visit – but with free Wifi access at the resort, we didn’t fret too much over the lack of planning. An overnight flight from Hyderabad, found us in Bali by 11:00 am local time. $25 later, we had our visa and were quickly out of the airport. We had pre-arranged for the resort to pick us up. An hour and half later , weaving in and out of Denpasar lunch time traffic and passing through the artistic villages of Celuk and Mas, we were at the Pandawas Villas in Ubud, the artistic capital of Bali. 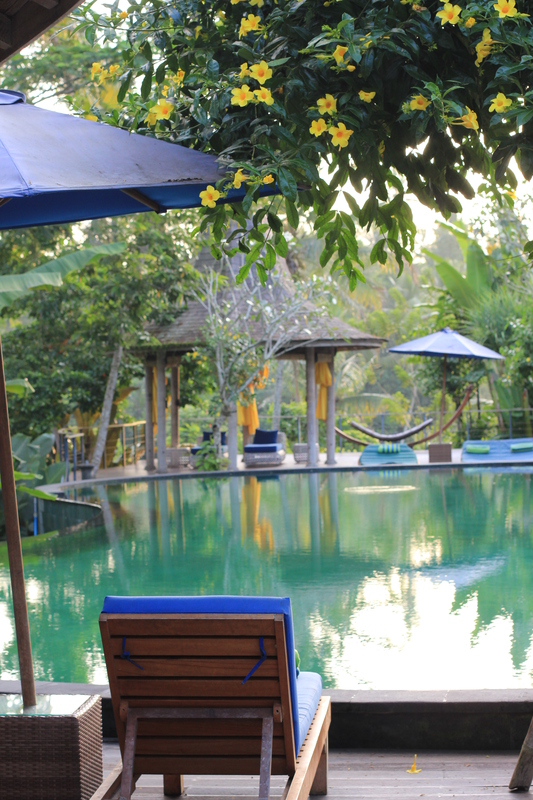 The Pandawas villas is an 4-villa property, about 10 mins from Ubud town center, overlooking the forest and the rice paddy fields and truly representing the Balinese indoor-outdoor living lifestyle. We simply loved the oversized villa rooms, the large patio outside the villa overlooking the fabulous pool and the outdoor shower and copper bath tub. A quick-lunch on the patio,Varun was running around the patio and splash water in the pool while we lounged around. Late evening, Varun was tired and fell asleep. Trying to take advantage of his long nap, Vipul and I decided to catch a traditional Balinese dance performance. 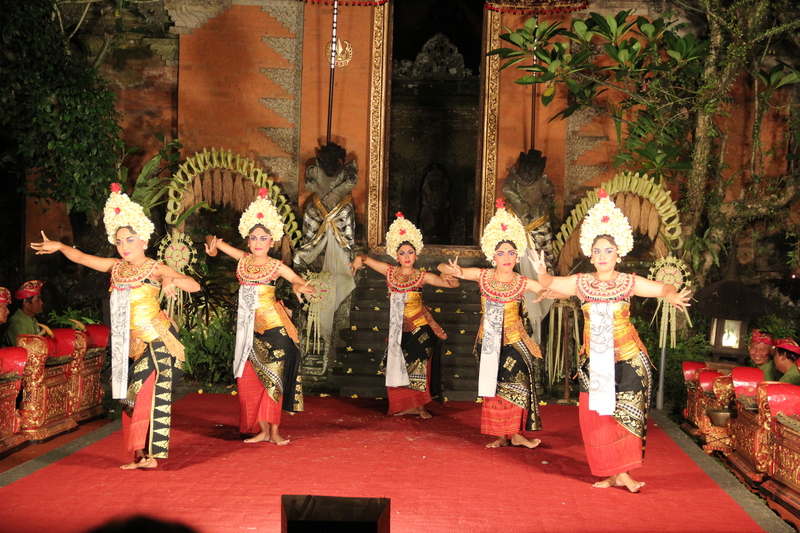 As this was Friday night, the Ubud Royal Palace had the traditional Barong and Legong dance. We had no idea what to expect and the performance blew our mind. The open paved courtyard of the Ubud Royal Palace, the cool mountainous breeze, smallish earthen lights flickering in the night and a magnificent dance performance of the Balinese women to the live gamelan music. Varun slept through most of the Legong performance – the Balinese nymphs trained to entertain royalty. 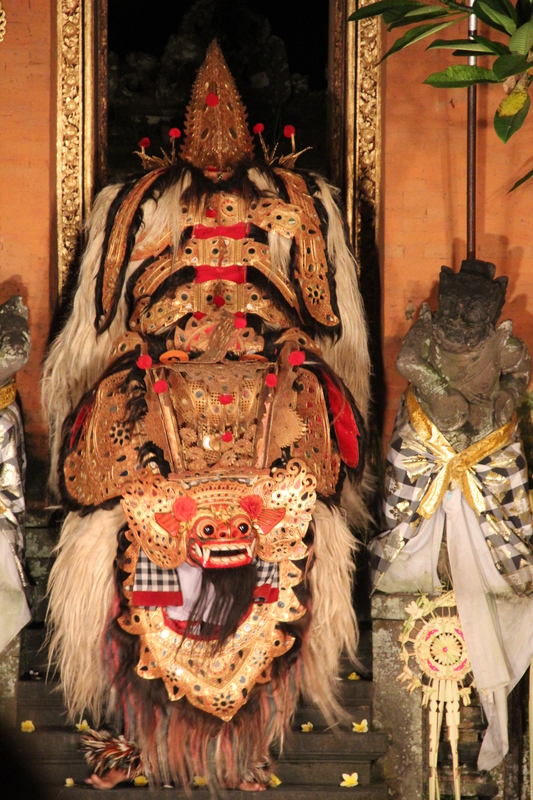 And woke up in time for the light-hearted Barong routine– masked dragon and monkey dance. It was magical to sit under the starry night and swaying trees. After the performance, we walked to Lotus café for dinner. 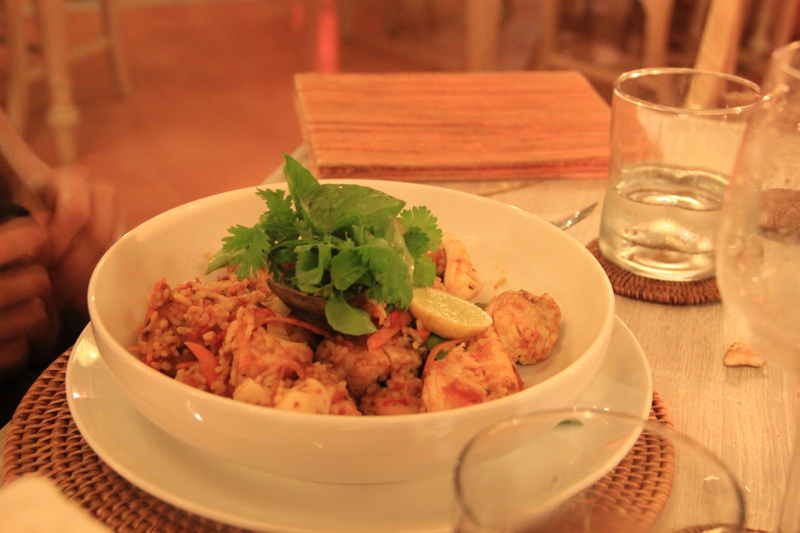 We sat in the Balinese style huts with low tables and had typical Balinese 3-course meal while Varun played around. 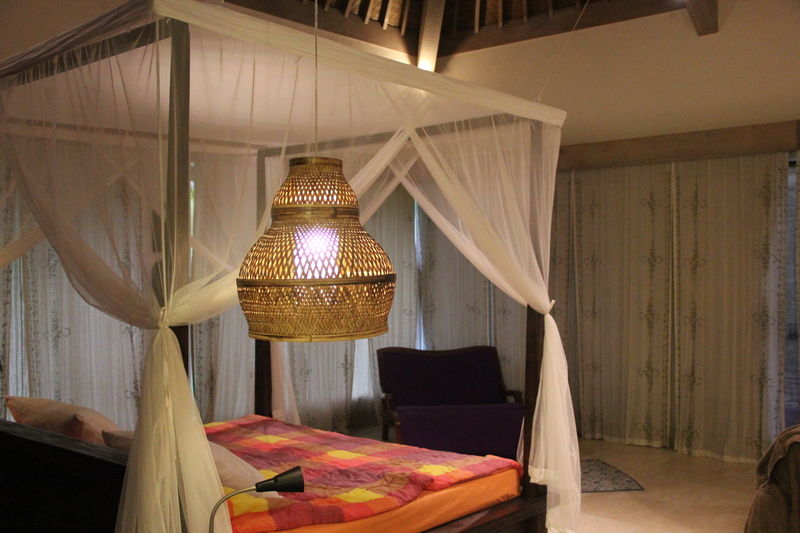 A quick cab back ride back to the villa later, we climbed into the king bed and snuggled under the white net canopy. I don’t recall when Varun slept, by I am sure, I slept almost instantaneously. Sometime before buying tickets for the performance and actual performance, Vipul and I wandered around to find an ATM and find a cab for day trip. We actually asked rates to a couple of cab drivers. They seemed close, so we randomly picked one – Mr Yogi, who asked for about $45 for the day. We had told him that we would call him in the morning to based on when we woke up and then we would go out for the day. 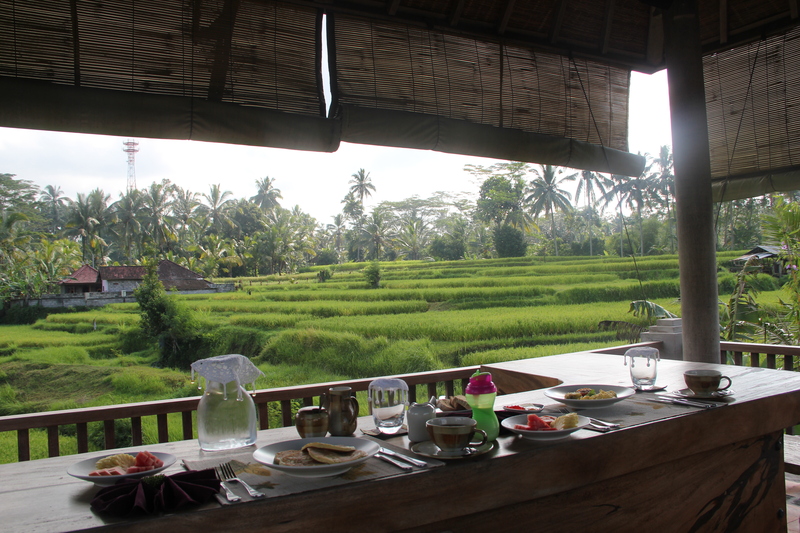 The day started with breakfast overlooking the rice fields. A quintessential Balinese experience – it was so cool we could experience it right away without having to leave the resort. 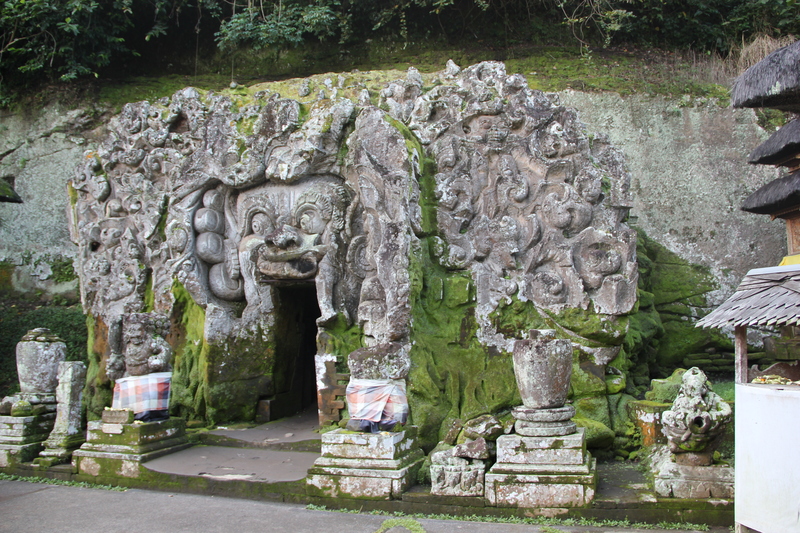 Mr. Yogi planned the day for us, starting with the 11th century meditation caves – Goa Gajah. 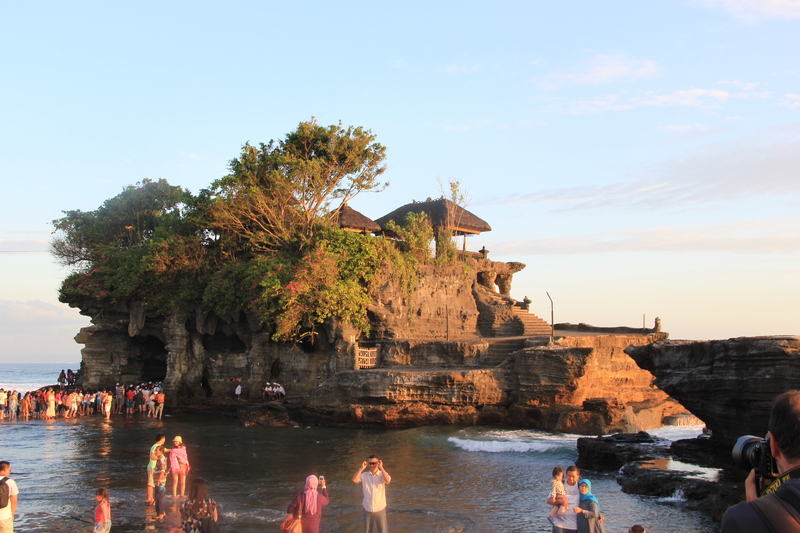 Outside the caves are the traditional Balinese temple baths to cleanse before heading for the meditation.Inside the caves are the statues of Ganesh and Shiva – who are both worshiped amongst other Hindu deities. We borrowed the temple sarong as Balinese are modest traditional lot and don’t like exposed knees (signifies disrespect to the Gods). 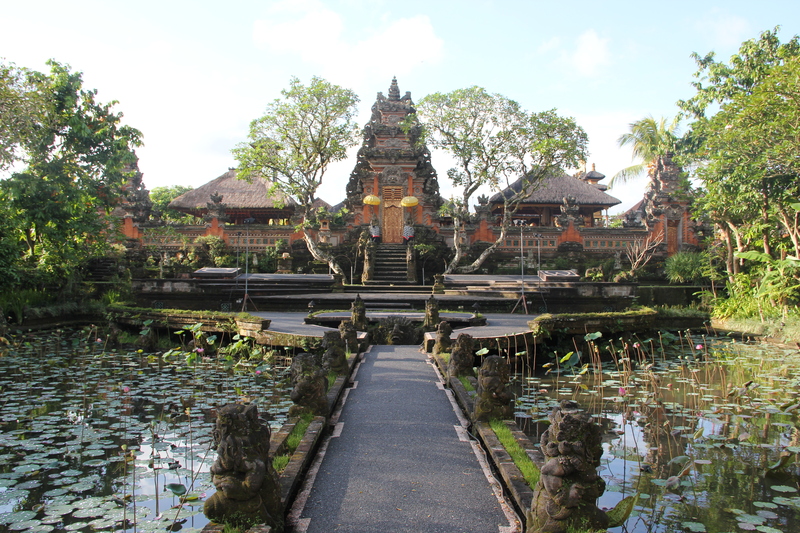 Next, we drove north to Tirtha Empul. This is another temple complex where worshippers come to take bath in its holy waters to purify and get rid of bad dreams, past etc – similar to taking a bath in Ganga in Haridwar.Here, again, we borrowed some sarongs before went in. It so happened to be an auspicious day and all the temples we visited were thronged by worshippers dressed in white performing puja’s, reciting hymns and carrying offerings to the Gods. 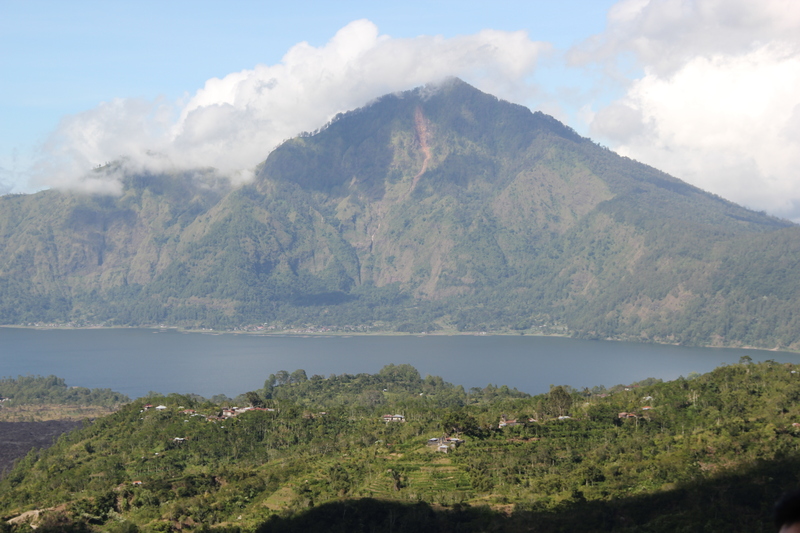 Next we drove further north to Kintamani and Lake Batur – a beautiful volcanic mountain overlooking a serene lake. 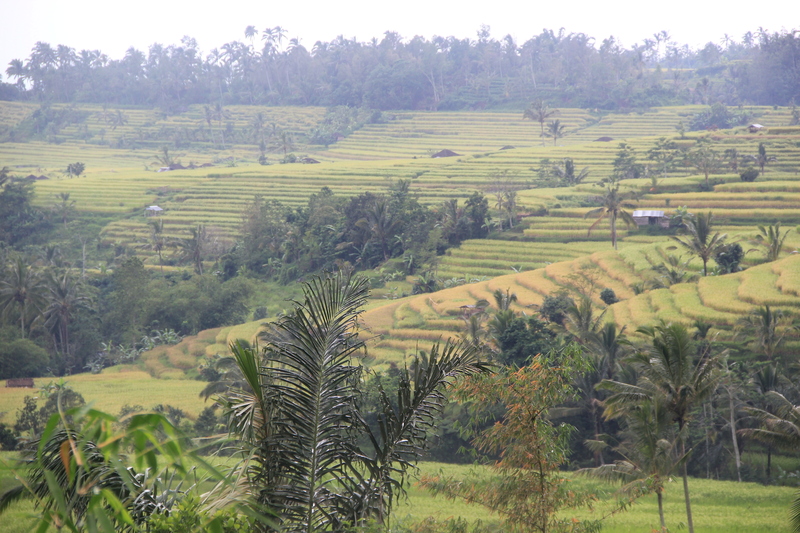 The route passes through Bali’s agro district – with several coffee and spice plantations. 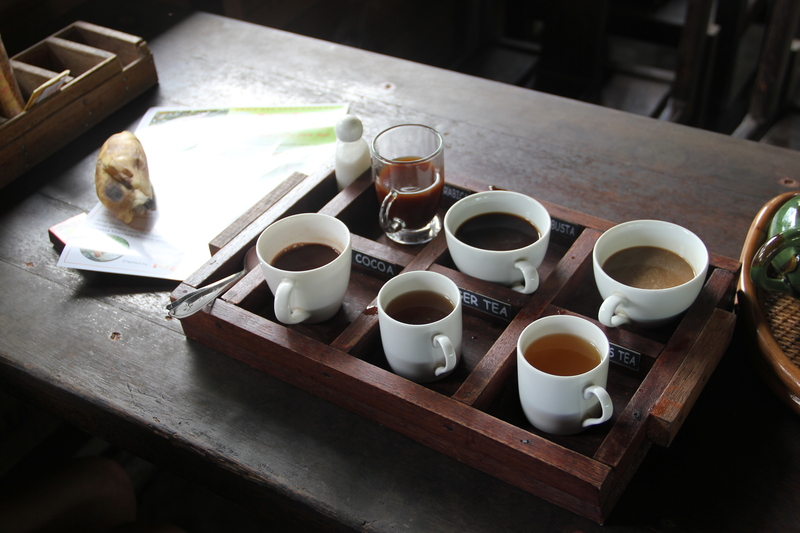 We stopped for a coffee break, where we sampled a variety of coffee’s , including the famous Luwak coffee – coffee beans digested by Luwak ( a small raccoon type animal), and then collected, cleaned, roasted for an incredibly smooth coffee. Re-energised with coffee and hot chocolate, we continued on our drive north admiring the rolling hills and the spice plantations. Varun, still a bit jet lagged and tired, slept through the drive. 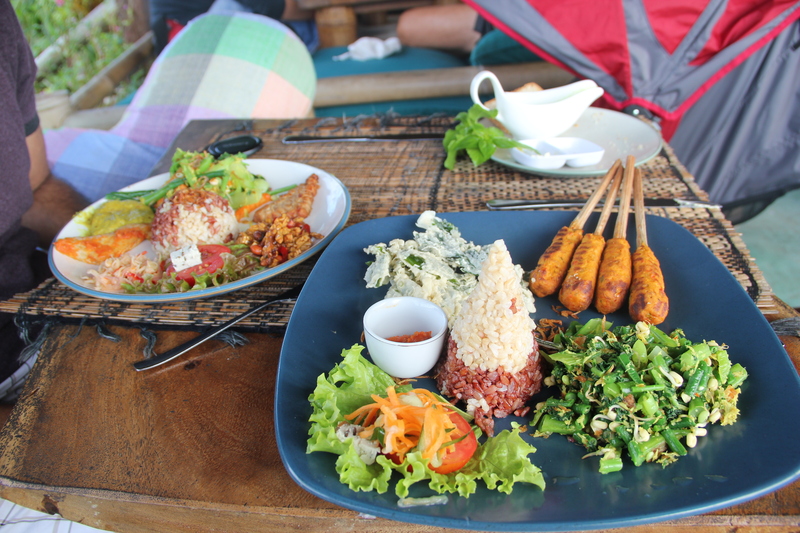 We had lunch at one of the many restaurants lining the Kintamani viewpoint. It was a buffet lunch – its virtually impossible to find a non buffet/ ala carte place during lunch time at any tourist location. 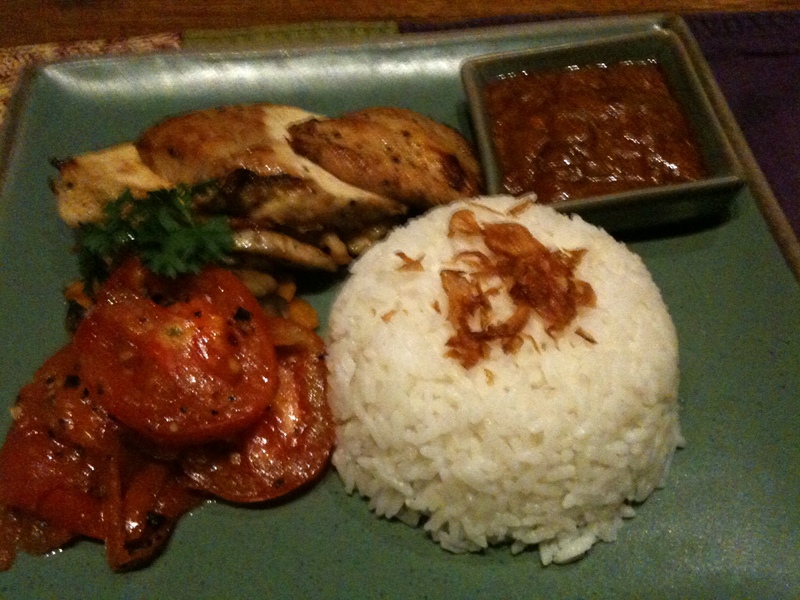 For $15/pp , it wasn’t a bad lunch although it was a bit pricey by Balinese standards. The best part of the lunch – chicken sate and black rice pudding which we loved so much that we got black rice to make at home. 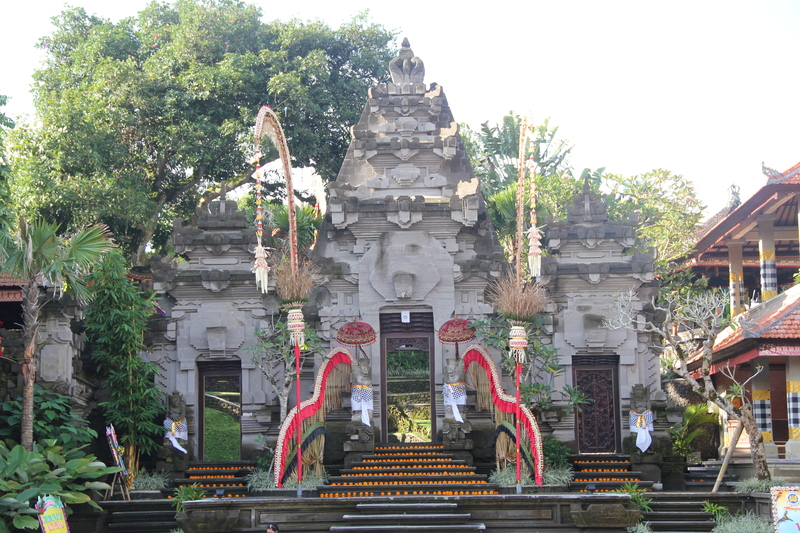 As Varun was still asleep, we decided to drive east and visit Besakih, the biggest temple complex in Bali. Varun woke up just as we reached the complex. Instead of borrowing a sarong again, I decided to buy one. Vipul exercised his bargaining skills and a few minutes later, I was a proud owner of a beautiful red batik sarong J . We spend some time wandering the temple complex. Varun simply wanted to run around and we had a hard time chasing him and controlling him on the unevenly paved courtyard, steep staircases etc We left as rain clouds loomed overhead. 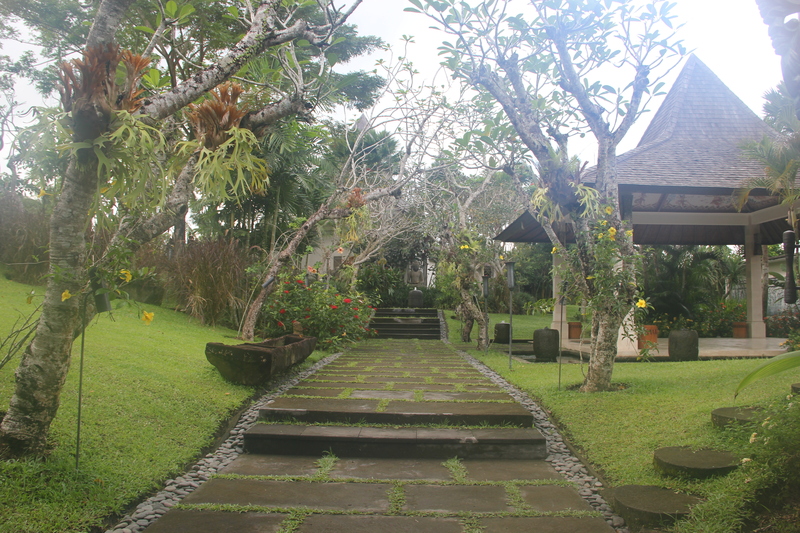 We headed back to Ubud and stopped enroute at Tellagang for another coffee break. We had Tellagang to ourselves as all day trippers from the south had left for the day.The café overlooked rice paddy fields. 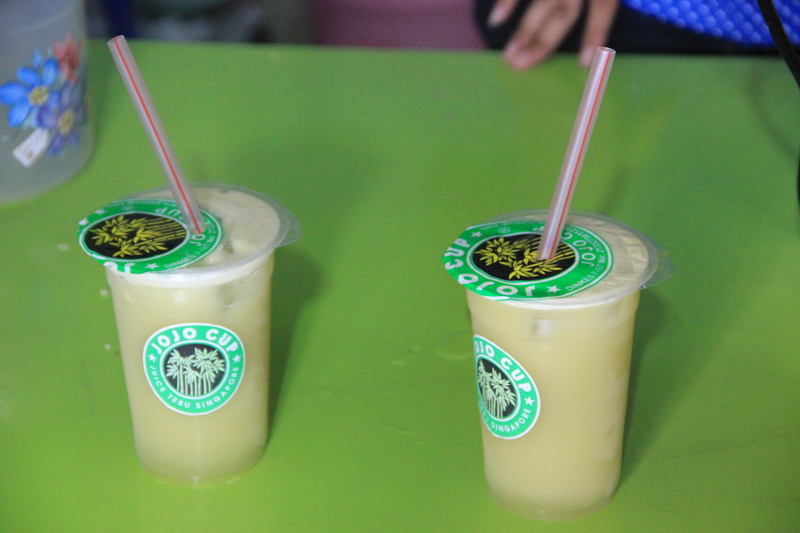 As we sat in the café, we marveled quietly at the lush greenery, coconut trees and the terraced fields. Varun was playing with our driver, letting us put our feet up and relax. Luckily, Tellagang was only 20 mins from our hotel and we reached hotel before dusk. Once back, Varun and Vipul took a quick dip in the pool, while I filled the bath tub. The oversized bath tub took a while to fill, but once it did, Vipul, Varun and I had a ball relaxing in it. The open air, the light frangipani fragrance and chirping insects outside added to the magic of the evening. Refreshed, We headed out for dinner to Bridges. After two not so good Balinese food experience, we carved for something familiar – so Italian it was. The good part of travelling in off-season is that you don’t need reservations and we walked in and were promptly seated. A little girl from an adjoining table entertained Varun while we enjoyed an awesome meal in peace. To top it off, Varun slept on the ride home, letting us turn in early as well. 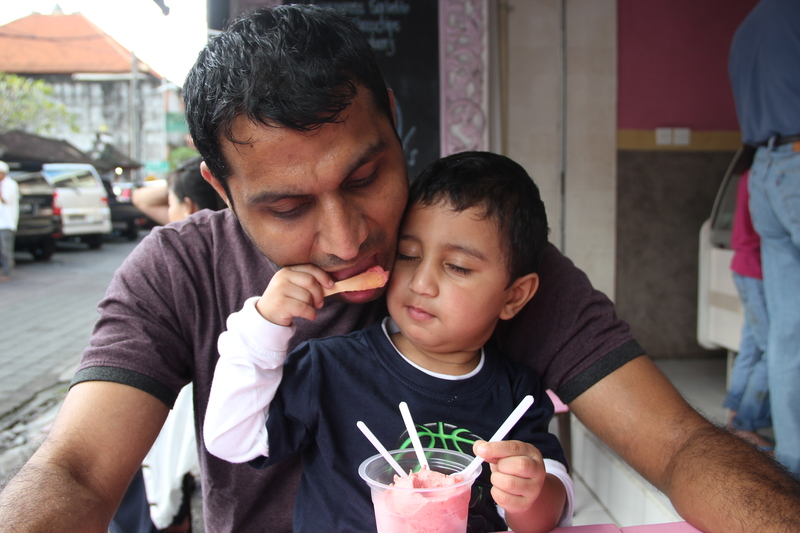 We had always decided to take one day at a time in Bali, based on how Varun handled the travel. 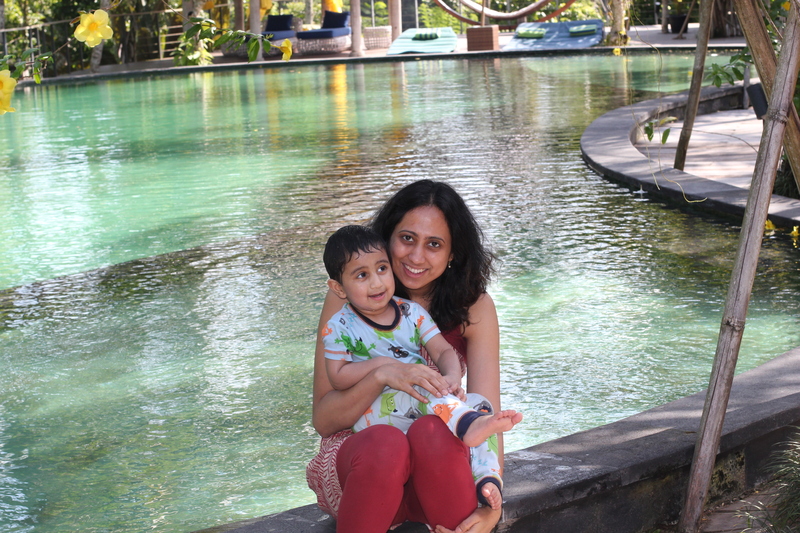 As Varun has fun on previous day, we decided to take him to Bali Zoo and Marine Park. Anyways, it was raining in Ubud and we headed South. Varun is in love with animals and fishu (as he calls fish) and so it was a perfect after a day of temples. We took our stroller with us and spent most of the day at the park. For about $50 / pp, we got to take a bus ride through the zoo, visit the aquarium , water park and see a well –orchestrated Balinese show about Balinese history depicted through all popular Balinese performances (Legong, Barong, Puppets, Gamelan music etc). 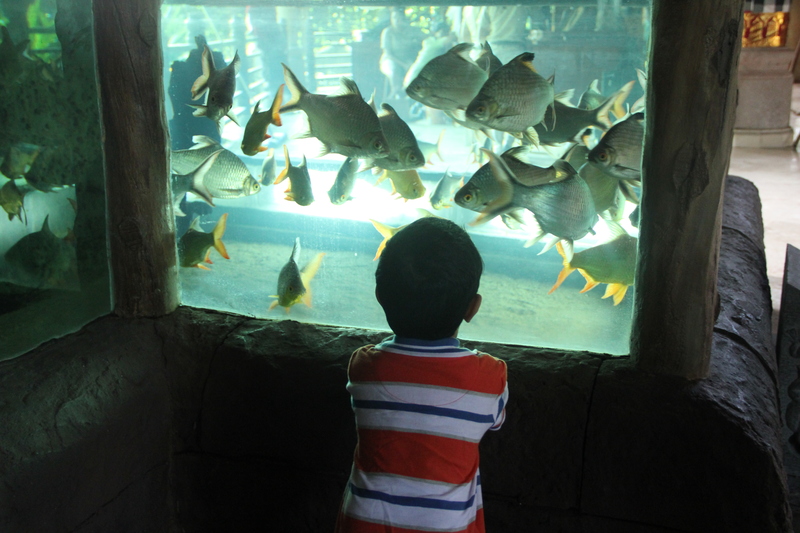 Varun especially loved the animals – calling out them to ‘stand’ and not ‘sleep’ in the mid-day heat and the fishes! 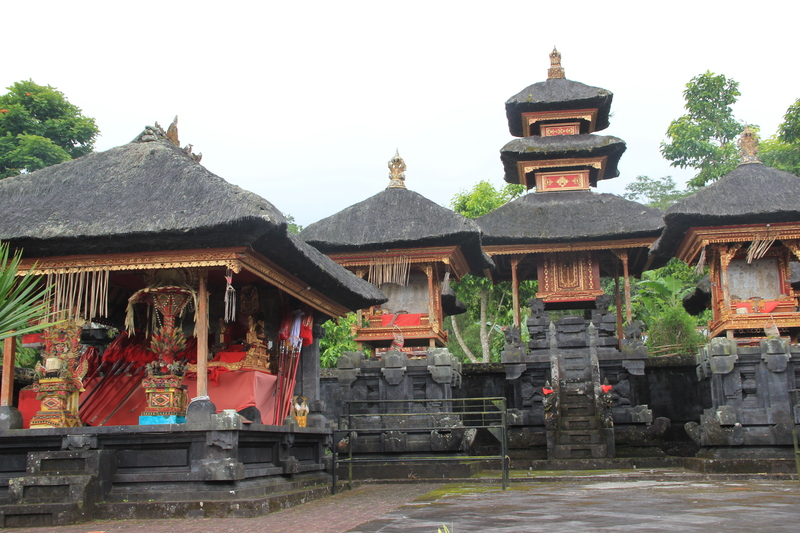 After the park, we planned to go to Uluwantu – a beautiful temple at the southern tip of Bali. The sunset from here is supposed to be truly spectacular. But given the clouds over the horizon, the peak traffic crossing through to Denpasar, we decided to go instead to Jimbaran, a beautiful beach on western coast of Bali. 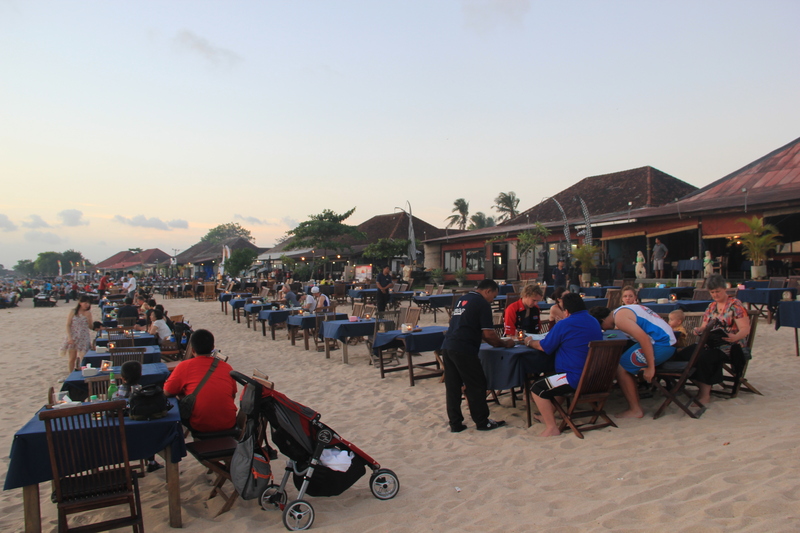 It is famous for its BBQ seafood dinner on the beach. A quick stop at Dunkin Donuts for coffee and donuts later, we were at the beach. 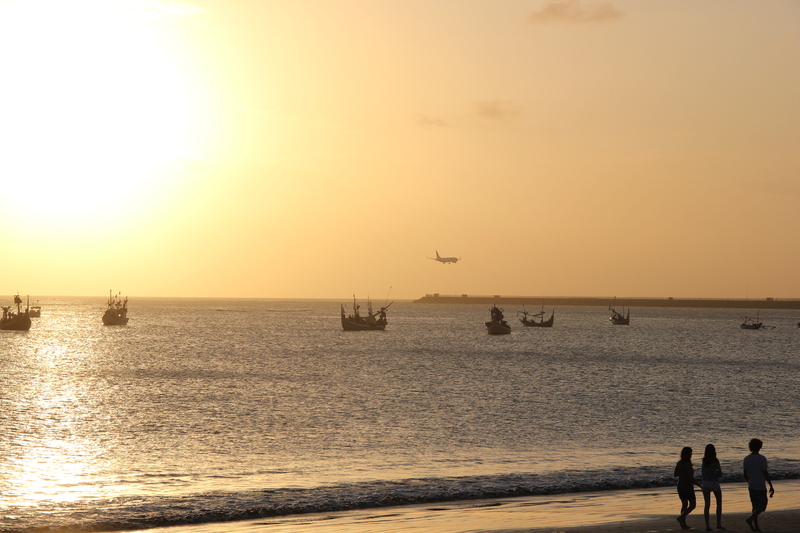 Varun was quickly covered in sand and even chased a dog around while we sat with Bintangs , watching the boats and planes bob into the sunset. The dinner on the beach was a tad overcooked, but the ambience more than made up for it. Very likely, the restaurant we chose was not the best but we just walked into a place that was not overrun by big bus tours. Also, as the beach does not have outdoor showers, as we are used to in US, I had to clean Varun in the bathroom using a hand shower. The cold water had Varun screaming, but it was better than have sand on him everywhere. A bottle of ‘su su’ or cold sterile baby milk later, Varun was asleep in the car while we drove back to Ubud.